JGU Mainz strives to create an environment that facilitates the combination of family and career. Family friendly facilities have been created that include baby changing rooms, advisory services, a flexible child care back-up service, together with a network of child minders. In addition, a donation from Geotechnik Büdinger Fein Welling GmbH has provided a well furnished multifunctional parent/child room in the new Physics / Mathematics building, Staudingerweg 9, 2nd floor - Room 120, on the university campus. 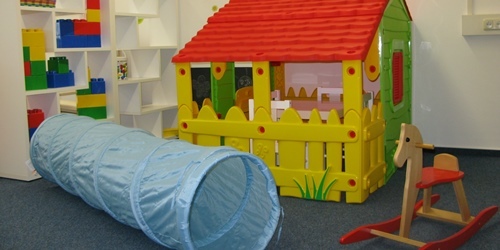 This room offers an alternative solution when child care cannot be provided due to staff shortages or other circumstances. In addition to baby changing facilities, cribs, and toys, there are also three work stations available at present.